We are of the belief that generally people do not accept any gospel literature willingly and if they do they are unlikely to read it...BUT...if the tract or leaflet does not 'look' like a gospel track they take them and they DO read it. Our Haggis tracts are a great example of this and we have people coming to ask for more to send to their friends and family. People will keep the card because of the joke on the front BUT the gospel is plane and simple on the back. We have seen them posted on office notice boards and even in staff rooms and shops...and yes, we have seen people saved through these tracts. A very important part of our ministry is our website where we stream LIVE service broadcasts and people can tune in later to watch a pre-recorded service. We have been broadcasting on-line since 2006. Previously, we recorded each service and sent out DVDs. 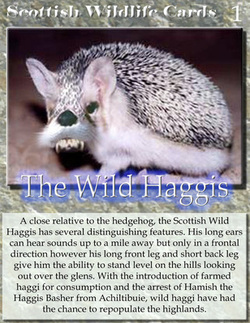 Again with the concept that non-church people read Christian sights very often (other than to find fault) we expanded on our Haggis tract and made a website to go along with it. The Haggis is a long running joke in Scotland and is a perfect conversation starter with local people. It was not designed for a worldwide audience but it has been accessed around the globe, whether by ex-pats or people with an interest in Scotland. A very high percentage of people do click through and take the personality test and read the gospel message. We have had many emails from the sight and all very positive comments and results. It also is shared around the world on Facebook, E-mail and other media outlets. Pastor Strachan has a weekly radio show on a secular radio station and plays good gospel music and presents the gospel every week. He has readings from the King James Authorised Version and discussions about the passages. It has a good following including non-church people.